Inovateus Solar and Ancon Construction are excited to announce that work has concluded on an office build out. The project, which was overseen by Project Manager Todd Stone and Foreman Matthew Krause, transformed a former warehouse space into a modern office space. The project included six private offices, an open office, conference room, employee lounge, and two story atrium space. 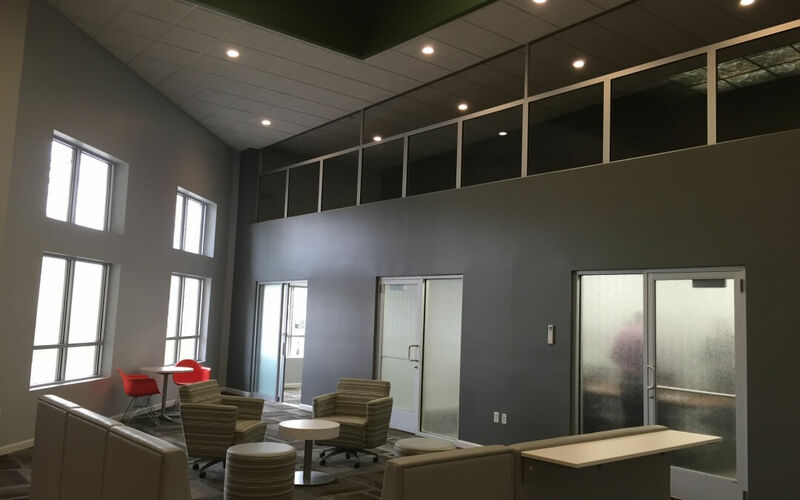 Our team enjoyed thinking outside the box with this project – from the sliding glass doors into each office to the comfortable and inviting “think tank” space in the daylit atrium,” explained Ancon representative Matthew VanSoest. “Modern and innovative design elements reflect the culture of the company – which was just named to the 2016 Best Places to Work in Indiana,” VanSoest added.